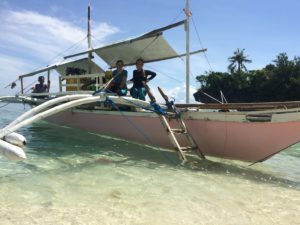 Diving is well underway here in the Philippines – we (Michelle, Joyce, and Allison) are back for another season studying metapopulation dynamics of reef fish. 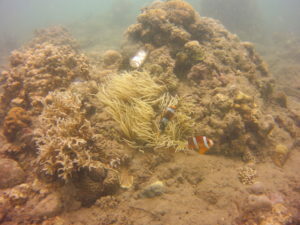 So far we’ve been visiting the northern sites in our study area in the Albuera municipality and have caught (and released) almost 200 clownfish. See the boat we’re using and the fish we’re looking for below! 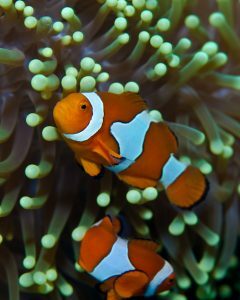 Amphiprion clarkii, the yellowtail clownfish, with Heteractis crispa (the anemone). An anemone tag is visible above. Jordan Holtswarth joined our lab last summer as an REU student and did a wonderful job analyzing photos we had on clownfish reproduction in Leyte, Philippines. Her paper showing they breed November-May (the cold months) is just out in Bulletin of Marine Science. Allison Dedrick and Joyce Ong have just joined the lab as postdocs, and we’re excited to have them here! Allison is coming from a Ph.D. with Marissa Baskett and Loo Botsford at UC Davis, and Joyce just finished her Ph.D. with Mark Meekan at U. Western Australia. They will be working on reef fish metapopulation dynamics (Allison) and synchrony in marine population dynamics (Joyce). 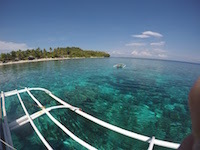 It is May, and we have a larger-than-usual team this year headed to Visayas State University in the Philippines to continue our research on metapopulation dynamics in coral reef fish. Michelle is leading the tagging and sample collection, Katrina is trying new oceanographic measurement sand field experiments, Allison is getting her first introduction to the system in preparation for modeling efforts, and Malin is helping out all around and catching fish (thanks to training from Tony Nahacky last year). We also have the indispensable help of local assistants Gerry Sucano and Rodney Silvano, plus Apollo Lizano (visiting student from U. Philippines Marine Science Institute). It’s great to be in the water again! New paper: where did Nemo go? 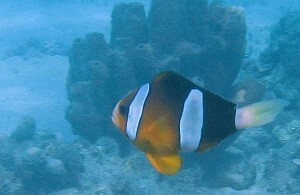 Photo of orange clownfish courtesy of Simon Thorrold. Baby fish float on ocean currents. So where do they go? Our paper out this week in Current Biology uses DNA to answer that question for clownfish in Papua New Guinea, and about 20 km is the simple answer. What’s especially exciting is that we show how very common and easily measured population genetic patterns called “isolation by distance” accurately measure the larval dispersal process. We validated our answer against observations of dispersal for hundreds of individual larvae (an incredibly time-consuming endeavor). Our findings help open the door to applying the isolation by distance method to a much wider range of marine species. This work was the result of an exciting collaboration with Serge Planes, Geoff Jones, Simon Thorrold, Pablo Saenz-Agudelo, Michael Berumen, Michael Bode, and others. 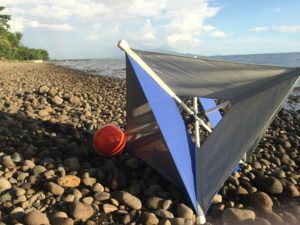 Took a while to get through all the photos from May/June fieldwork in Leyte, Philippines, but Michelle just posted a few highlights on the Photos page! Welcoming Wijnand Boonstra, Katrina Catalano, Sarah Gignoux-Wolfsohn, and Emily Moberg! The lab is busy these days, and we’re excited to welcome a visitor, a new Ph.D. student, and two new postdocs! Wijnand Boonstra is a sociologist from the Stockholm Resilience Centre, visiting to work on fisheries dynamics related to our NSF Coastal SEES project and GreenMar. Katrina Catalano just finished her B.S. at Boston University and a field season in Belize. She’s interested in larval dispersal and reef fish metapopulation dynamics. Sarah Gignoux-Wolfsohn is joining us from a Ph.D. at Northeastern University and will be working on population genomics and white-nose syndrome in bats with Brooke Maslo on our USFWS-funded project. 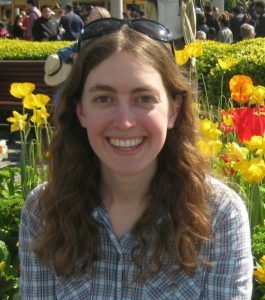 Emily Moberg is joining our Coastal SEES project to work on bioeconomic models of fishery responses to climate change in collaboration with Eli Fenichel and Simon Levin. She just finished a Ph.D. in the MIT/WHOI program. 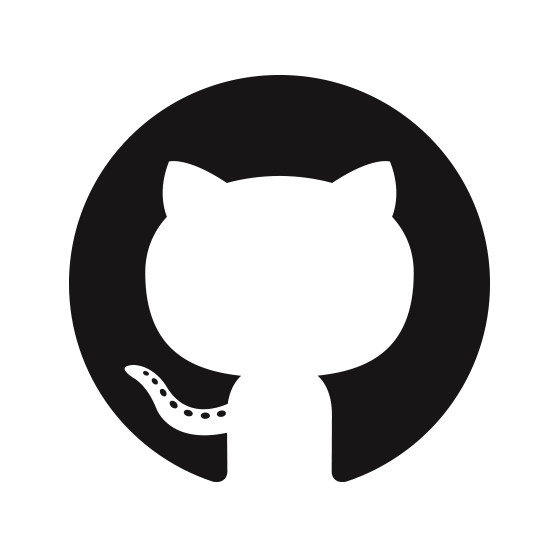 See our updated People page! One postdoctoral position and one PhD position are available in the Pinsky Lab at Rutgers University to study demography and metapopulation dynamics in clownfishes. The research is based in the Philippines and builds from six years of demographic and population genomic data. Key themes across both positions include understanding mechanisms of persistence in ecological networks by integrating massively parrallel DNA sequencing with ecological field studies. Both positions will also work closely with Will White at U. North Carolina – Wilmington on theoretical and modeling aspects of the research. 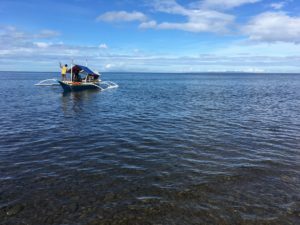 Research in the Pinsky Lab broadly uses empirical data, mathematical models, and population genomics to study global change in the coastal ocean. 1) Metapopulation dynamics postdoc: The postdoc will lead data analysis, integration, and modeling to test hypotheses about self-persistence and network-persistence in coral reef fishes. The research will be based primarily around existing data from mark-recapture studies, parentage studies, ecological surveys, and other sources, though opportunities also exist to collect new data. This position has two years of funding. 1) Metapopulation dynamics graduate assistant: The GA will lead research on marine demography using field observations and experiments combined with population genomics. Possible topics include, but are not limited to, dispersal, density-dependence, reproduction, survival, thermal physiology, species interactions, and landscape ecology. Projects could involve a mix of field work, genomic wet lab work, bioinformatics, and ecological modeling. This position has five (5) years of guaranteed funding. Across both positions, the ideal candidates will be skilled with data analysis, statistics, ecological modeling, and databases (or a strong aptitude for learning these skills, in the case of the GA). Applicants with evidence of creativity, productivity, strong oral and written communication abilities, and enthusiasm are especially encouraged to apply, particularly those that bring a new perspective, new ideas, or a new skillset to the team. For postdoctoral applications, a promising record of publication is highly valued. The successful applicants will be independent, motivated problem solvers who communicate well and enjoy working in a collaborative setting. Rutgers and the surrounding area provide an exciting intellectual environment, including the Department of Ecology, Evolution, and Natural Resources; the Department of Marine and Coastal Sciences; the Institute of Earth, Ocean, and Atmospheric Sciences; the Genome Cooperative; the NOAA Geophysical Fluid Dynamics Lab; the Princeton Environmental Institute; the Center for Discrete Mathematics and Theoretical Computer Science; and beyond. The postdoc start date is flexible and the position is open until filled. The GA will begin in summer or fall 2017. Review of postdoc applications will begin on October 1, 2016 and will continue on a rolling basis. Review of GA applications will continue on a rolling basis until December 2016. Interested postdoc candidates should submit: 1) a one-­page cover letter that describes which position(s) they are applying for (and preferred position if applying to more than one) and their preferred start date, 2) a two-­page research statement describing their relevant background and anticipated research approach to the problem they would be addressing, 3) a CV, and 4) the names and contact information of three other scientists familiar with their work. GA applicants should include a 1-2 page cover letter describing their interests, CV, a recent transcript, GRE scores, and contact information for three references. Qualified GA candidates will be contacted and encouraged to apply to the graduate program in either Ecology & Evolution (http://ecoevo.rutgers.edu/) or Oceanography (http://marine.rutgers.edu/main/IMCS-Academics/Graduate-Program-in-Oceanography.html), depending on student interests. Ph.D. applications to Rutgers are due in December. Please submit all materials to malin.pinsky@rutgers.edu with “Postdoc application 2016” or “Graduate application 2016” as the subject. Jordan Holtswarth has joined us for the summer as part of the RIOS program, a NSF-funded Research Experience for Undergraduates. 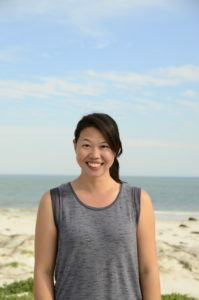 She comes from the University of Missouri and will be helping analyze data on clownfish reproduction. Come see us at Ocean Sciences! Nearly the whole lab and many collaborators will be at Ocean Sciences in New Orleans next week talking about our work!